MEINL stick bags offer plenty of room for you to carry multiple pairs of sticks, mallets, and brushes - whatever you need for a successful gig or rehearsal. The external pockets are great for storing drum accessories like keys, felts, and miscellaneous tools for on the spot fixes. These carrying bags are durable enough for even the toughest of road warriors. It is part of Meinl's mission to ensure easy transportation and protection of your instruments and gear. 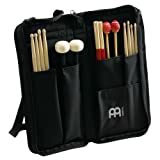 Interested in the Meinl Percussion Drum Stick Bag with Extra Outside Pocket and Floor Tom Hooks – for Mallets, Brushes and Other Common Accessories As Well Black MSB-1? Is the price too high? You can easily price watch this product and we'll notify you when the price reaches your target.